Here come the bride and groom...pretty soon. 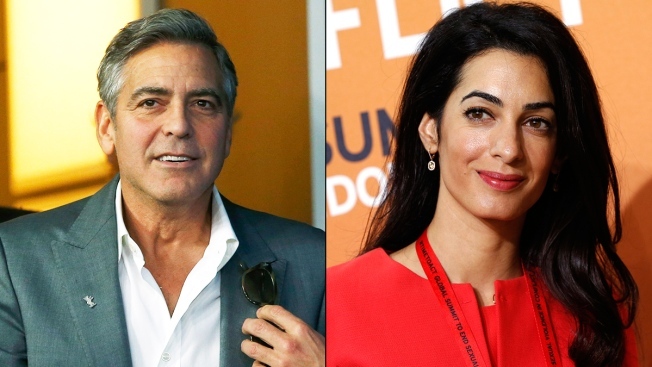 George Clooney and Amal Alamuddin have obtained a marriage license in London, according to multiple reports. Cheers to England, meanwhile, for still taking the time for royal proclamations. Or, in this case, Hollywood-royalty proclamations. A picture taken of a notice of their intent to wed that was posted outside of Chelsea Old Town Hall was first obtained by Dlisted, sent to them by an eagle-eyed reader. The public posting is a legal requirement when the proposed marriage involves citizens of the European Union, such as Alamuddin. Clooney and Alamuddin have seemingly been scouting locations near his home in Lake Como and, sure enough, Italy is listed as the wedding location. So these nuptials must be right around the corner, right?! Per regulations set forth by the Royal Borough of Kensington and Chelsea, if one half of the couple (or both) are non-EU citizens then you must both give former "notice of your intention" to a superintendent registrar at a designated register office. The notice is then displayed at the register office where they've given their notice "for a period of 15 clear days and only then can the authorities which allow your marriage to go ahead, be issued." However, after that, the license is good for 12 months and, if you change your venue, you have to reapply. So theoretically there's still lots of time for Clooney and Alamuddin to prepare. Heck, they may even get to mark a whole year as a couple before they tie the knot. Clooney popped the question in April after barely seven months of dating, offering up a 7-carat diamond ring estimated to be worth at least $750,000.